Eddie Harris is a ‘normal’ dad, who loves his life, his job and most of all his family. His philosophy is honesty and frankness and agrees with his wife Jeanie to be open and natural when answering their children’s questions, no matter how embarrassing. This backfires when their daughter stumbles in on them making love, and proceeds in all innocence to regale her school with her inside knowledge of the carnal pleasures. Jeanie is asked to see the Head Mistress who is slightly concerned at the level of Katie’s knowledge and at a picture Katie has drawn of Eddie dressed up as a ‘rough old granny’ – a bath-time game they play. Eddie soon finds he is being investigated and, in an attempt to keep his family together, is forced to exile himself from the centre of his family until the matter is dealt with. 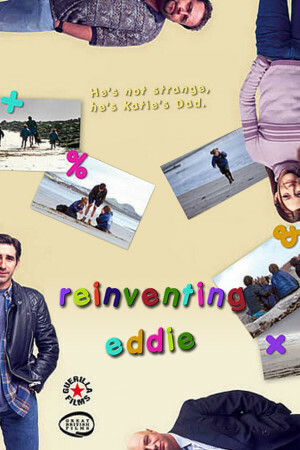 While in exile Eddie gets the benefit of some misguided advice from his best friend Cliff and embarks on a quest to become a ‘normal’ dad again. Wickedly funny and extremely poignant, Re-Inventing Eddie is a journey of lost innocence and false accusations.